The ghost Castle Dunstanburgh stands impressively on the marine cape on the coast of Northumberland County in the north of England. This castle, of which today are more of damaged walls is located between the villages Craster and Embleton. Dunstanburgh is considered the largest castle in the territory of this northern English county. 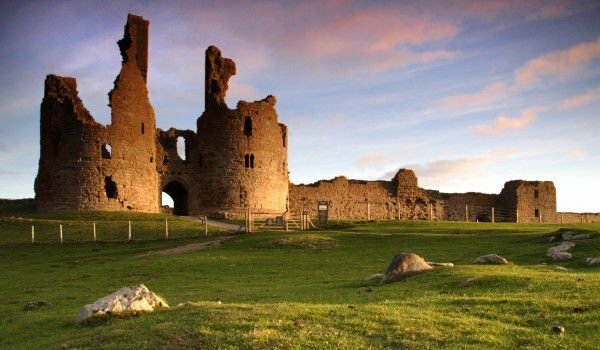 Dunstanburgh’s dramatic story begins with intense moments when its foundations were laid. At that time relations between King Edward II and his most powerful baron, Thomas, Earl of Lancaster, were openly hostile. Archaeological researches are adamant that Lancaster’s palace is of a much larger scale than what was actually needed. It is believed that this was rather a gesture of opposition to the column to the crown and royal power, and he built Dunstanburgh not as massive military Ford but as a sign of defiance. Dunstanburgh porch of the castle was built in an unusual way for then, and resembles those of the palaces in Wales. It has become evident that at the time that Dunstanburg was built it was done so with admirable skill and high level of masonry. Well-lit residential chambers furnished with fireplaces may be found in the Lilburn and Constable towers as well as in the gatehouse. The large, apparently unused land in the middle of the castle Dunstanburgh may have served as a billeting area for troops. Comfort and pretentious designs are also not lacking. Each of occupied rooms were equipped with a fireplace and were well lit, as today, these spaces can be seen in the preserved parts of Dunstanburgh. Monumental ruins of the Castle Dunstanburgh are now a favorite place for the beautiful sea birds.